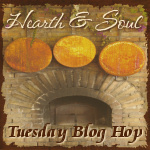 Welcome to The Hearth and Soul Blog Hop, a blog hop for recipes using healthy ingredients, family and comfort food recipes, articles about healthy living, real, local and sustainable food, foraging, herbal remedies, organics and gardening. As much as possible, recipes should be homemade from scratch. We spent this past weekend in Napa and Sonoma with friends, staying once again at the gorgeous Hennessey House Bed & Breakfast Inn. This time my husband and I chose the newly refurbished Foxes’ Den for our weekend base. It was so pretty and very cosy. We had been to Napa before but this time we took a guided wine tour and visited some wineries that were a bit more off the beaten track. On Sunday we explored Sonoma, finishing with lunch at Rams Gate Winery overlooking the vineyards. I really hope I can bring some of this gorgeous sunshine home to England with me! On with the Hearth and Soul Hop! Never miss a post – one email a week can keep you up to date! Sign up for my weekly newsletter in the box below the comments. That View is beautiful April. What a fun vacation. Thanks so much for featuring my strawberry and spinach salad! Have a wonderful week! Thanks so much for hosting April. That B&B looks gorgeous!! So glad you had a nice time! 🙂 Have a great week! I just love keeping up with your travels, we love Bed and Breakfast and lovely Inn’s. Hope you have a great week and thanks so much for the party! I think I have been to more places in England than the US. I have never been to CA’s wine country. Looks gorgeous. and I would love that sun shine and warm weather too. We are having a tough winter here in NY. Thanks so much for doing the party on vacation. This week I’m sharing an easy-to-throw-together beans and rice recipe! We really have enjoyed ourselves, Christine. My husband has been working but we’ve had some really lovely time together as well. I look forward to your recipe – it sounds delish! I am so envious! What beautiful surroundings, back to “sunny” UK soon! I’m so grateful to have had the opportunity to be here, Vicky 🙂 We head back today – so I’m literally soaking up every last ray of sunshine that I can before heading to the airport! It looks like you’re having a great time. What a beautiful view of the vineyards! Wine tasting is so much fun! Thanks for hosting while you’re on your vacation. I hope blogging isn’t interfering with your enjoyment. I always wanted to visit Sonoma. It looks absolutely wonderful. Beautiful! I love the woodstove in the bedroom. Thank you for featuring my Quinoa Loaf… thrilled to be in such good company! !